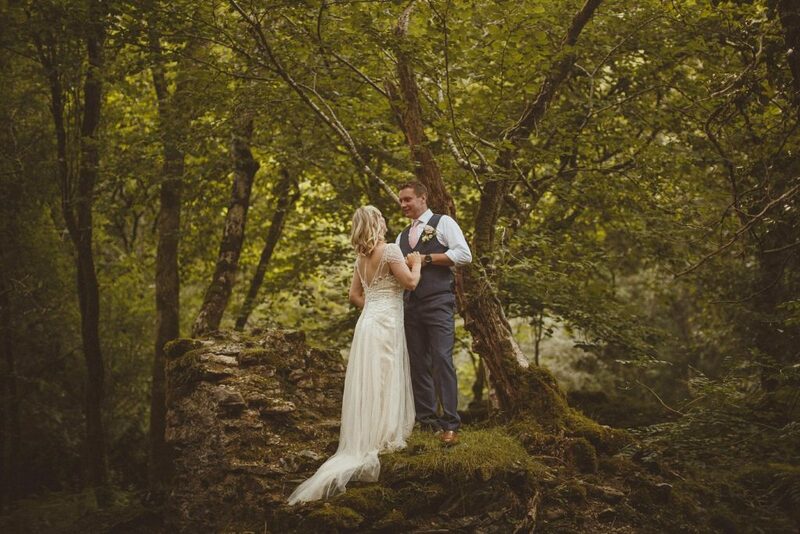 We know there are lots of reasons couples choose to book with us (fab location, amazing service, cool glass roofed terrace, beautiful gardens) and one of them is our woodland. We’ve got 46 acres of woodland which is designated a SSSI (site of special scientific interest) for its butterflies, mosses and wild birds. The woods are a super special place – as a former mine in Victorian times it’s got ruined granite buildings now covered in moss and ivy. We get couples asking if they can actually get legally married outside. The short answer is ‘no’ but the longer answer is ‘sort of’. The current law on legal wedding ceremonies in England and Wales says you have to get married in a licensed venue which must be a permanent covered structure. That’s why you sometimes see a weird little band-stand thingy at some venues. That’s their permanent covered structure and that’s where the two of you stand with the Registrar to get married. So that’s why you can’t have a legal woodland wedding, there’s no permanent covered structure in the woods so you can’t have a legal wedding there. Some of our couples have been so determined to have their wedding ceremony outside they get legally married outdoors before or after their outdoor ceremony. Some couples get married before they even arrive here for their wedding weekend. Others want to have their wedding ceremonies on the same day so they get legally married here, either early in the morning before the guests arrive or even when guests are enjoying drinks and canapés after what they thought was the legal wedding ceremony! 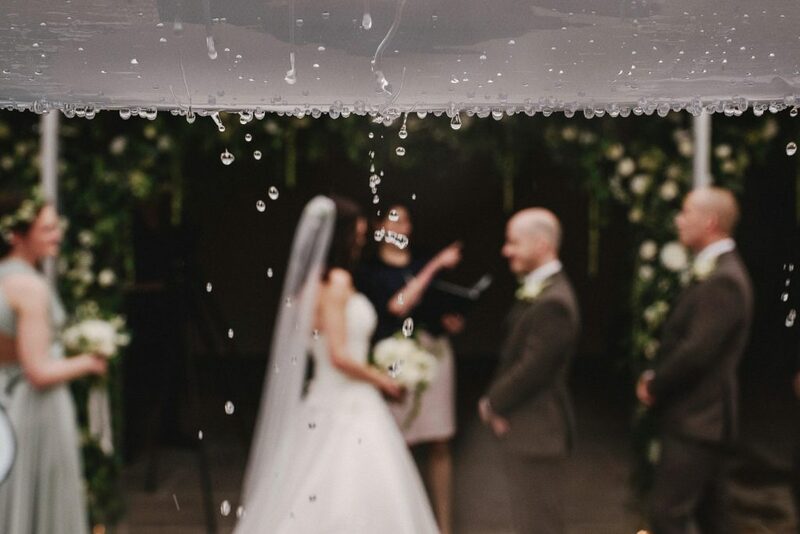 If you decide to get married outdoors in a non-legal ceremony, you need a plan B. Whilst the two of you might be happy to stand in the rain if the weather doesn’t play ball, some of your guests won’t thank you for a full-on rain forest experience. So you need to have a back up location to get married if it’s wet. Our wedding barn is our permanent covered structure and that’s where most of our wedding ceremonies take place. It’s the plan B if your outdoor ceremony is rained off. Our glass roofed terrace is also licensed by Devon County Council for our elopement weddings. If you’re having a big wedding with lots of guests, you need to think about whether your guests will cope with uneven ground in the woods. Elderly guests might find it hard to walk to the perfect secluded spot you’ve picked and if there’s been heavy rain, they’ll all need suitable footwear which they’ll want to change when they get back to terra firma so you could end up with 120 pairs of wet wellies to store for the day! 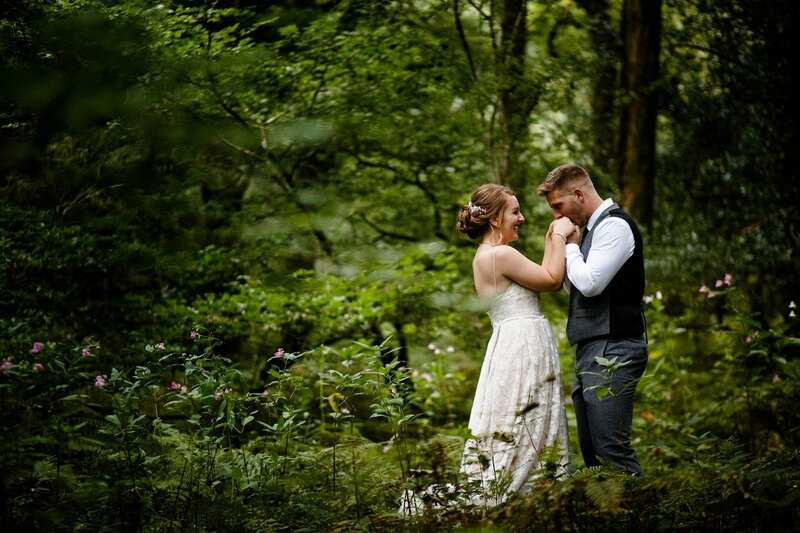 Couple photos in the woods are a perfect way to capture the woodland wedding feel for your day. You don’t need to get in a car and drive somewhere to get those pics, you just walk down the grass path, through the gate and ta da, you’re in the woods. We really get to experience the seasons in all their majesty here and the woods are a perfect example of that. In the early spring you’ve got the lime green of the new leaves and by June all the leaves are out and the wild foxgloves are in flower. By July and August there’s a complete green canopy, you can stand under the trees in the rain and not get wet. September, October and November see the colour changes bringing in butter yellow, copper, reds and browns with a carpet of leaves on the woodland floor. In the dead of winter (December to March) the trees have no leaves but there’s a different kind of beauty to the winter landscape. 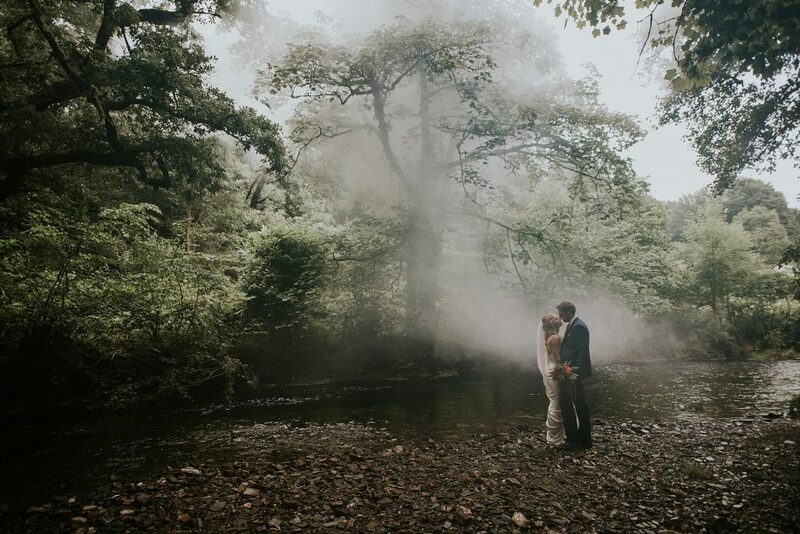 So no matter which time of year you’re having your woodland wedding, you’ll get some amazing woodland photos. See what I mean? Same woods, same summer. Different photographers, completely different photos. I’ll be coming back to woodland photos both summer and winter and focusing on the woodland photos for just one wedding so you can see more detail about what you can get from your woodland wedding photo sesh. Not all couples choose to have photos in the woods, there are plenty of places in the gardens you can have photos without venturing into the woods and I’ll be covering some of those spaces where you can get great wedding photos in future posts. If you’re considering us for your woodland wedding – get in touch! No time like the present, just ping me an email and tell me your plans for your day – I’d love to help you make it a reality. Email me at nicola@lowergrenofen.co.uk – I can’t wait to hear from you!